Order ‘Hoarders: Season One’ from Amazon.com by clicking on the DVD cover above! That’s the question on my mind today as I’m about to welcome Jodi Flynn, a producer of the hit A&E reality/documentary show “Hoarders” as my guest. 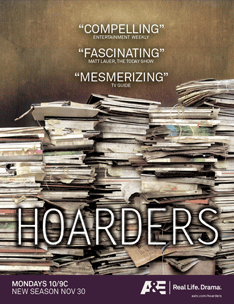 You can LISTEN to this interview with JODI FLYNN, producer of HOARDERS, by clicking the audio player above! The latter shows are serious, intense explorations of people whose lives have gone really wrong, sometimes through their own mistakes, sometimes through no fault of their own. So when I ask, “Where is the line?” I really want to know if there is a point in space we just shouldn’t cross out of respect for human dignity. Having said all that, does it make me a hypocrite to say you can catch Hoarders ever Monday night on A&E at 10 p.m.?